Don't Bump the Glump! turns fifty! A commemorative gold anniversary sticker graces Shel Silverstein's first poetry collection, celebrating fifty years since publication. This, his only book in full color, was published the same year as his famous classic The Giving Tree. Filled with stunning ink and watercolor illustrations, Don't Bump the Glump! 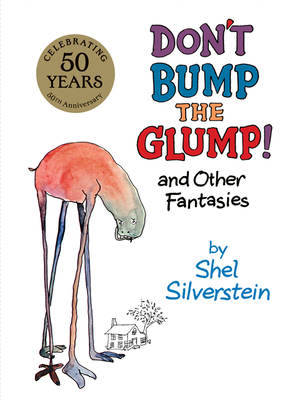 is bursting with Shel Silverstein's unique imagination and bold brand of humor. Are you ready to be astonished, tickled, and entertained by this most unusual bestiary of silly and amazing creatures? Shel Silverstein's incomparable career as a bestselling children's book author and illustrator started with Lafcadio, the Lion Who Shot Back. He is also the creator of picture books including A Giraffe and a Half, Who Wants a Cheap Rhinoceros?, The Missing Piece, The Missing Piece Meets the Big O, and the perennial favorite The Giving Tree, as well as of classic poetry collections such as Where the Sidewalk Ends, A Light in the Attic, Falling Up, Every Thing On It, Don't Bump the Glump!, and Runny Babbit.